Brexit: what is the point? The day before yesterday, the Guardian produced the results of something it and every major newspaper in the country should have done a while ago. It had sent a reporter over to Calais to look at the situation as regards the provision of a border inspection post, and had published a photograph of what was claimed to be the proposed site of the facility – an empty field. There, apparently, was physical evidence of the lack of preparedness of Calais port, and the Channel Tunnel – both supposedly sharing the same facility, providing a counter to the worrying raft of journalistic claims that the French would be ready for a no-deal Brexit. 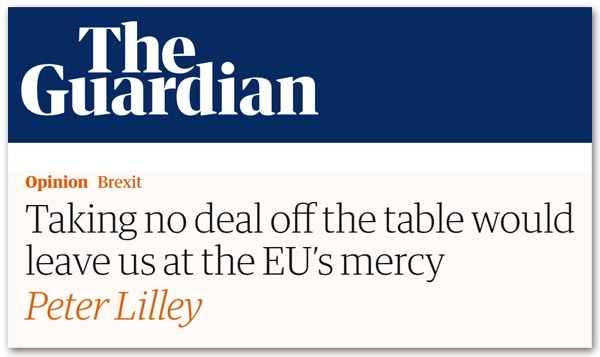 Yesterday, though, apparently ignoring its own report, the paper published a polemic by Peter Lilley, under the heading: "Taking no deal off the table would leave us at the EU's mercy". Now the Calais port chairman has claimed that Calais will have no more checks than at present. He says he is confident that traffic will flow freely. The port is installing three extra lorry lanes, an inspection post for animals away from the port, and a scanner for trains moving at 30km/h. When Mr Grayling came to Calais … we told him that we will be ready and as Great Britain has decided not to take any check in export and not any check in import, we will not check the truck more than we are doing today with the migrants. And the other thing that we will be only asking to the driver that they have the customs declarations. But we will not stop or ask more as we are doing today. But Puissesseau then goes on to concede that the port will "be checking with the custom the veterinary and phytosanitary control for which we have already been building infrastructure and parking", thus admitting to extra controls which are not currently being carried out. By any objective standard, therefore, what Lilley is saying is simply not true. There will be more checks than there are at present – and these could have a significant effect on the flow of traffic through both the port and the tunnel. However, Lilley goes one step further, asserting that there will be "an inspection post for animals away from the port" – an apparent contradiction if there are to be no additional inspections. But the assertion is not actually based on direct testimony by Mr Puissesseau. It rests on unsupported claims made by Iain Duncan Smith and David Davis – also on the Today programme - the latter saying that the veterinary checks would be "12 miles behind Calais", so there would be no blockages at Calais. This was apparently supported by a piece from James Rothwell in the Telegraph, but with no actual evidence offered. At best, therefore, Lilley's claim is unsupported but, by dint of our own citizen journalism, we have been able to establish – from publicly available records - that the claim is actually not true (and nor could it be, because it would breach EU law). Of course, one does not expect editors from the mighty Guardian to read a lowly blog, but one might expect them to carry out basic factchecking before they allow their commissioned opinion writers to perpetrate what is actually faulty information. And what this author can do, with minimal resources, surely a much better-resourced national newspaper can do with ease. Here, one recalls in December 2012, the very same Guardian lovingly reporting Lord Justice Leveson when he applauded established journalists as having "a powerful reputation for accuracy", while dismissing bloggers and tweeters as an "electronic version of pub gossip". So it seems the "electronic version of pub gossip" can actually work out whether or not there is a single centralised veterinary inspection post at Calais, and from an office based in an unfashionable suburb of Bradford – with the help of a few friends - while the national newspapers, with their "powerful reputation for accuracy", are content to rely on second-hand, unsubstantiated reports – which they are too idle to check. Lilley, of course, has been allowed to lie with impunity in previous reports but it seems entirely beyond the capability of the entire media industry to check the accuracy of what he is saying. Instead, they roll over and give him free license to claim whatever comes into his mind, without the least attempt to check its veracity. But, as regards the Guardian and yesterday's piece, one has to ask: what is the point? What is the point of giving free rein to a man who, with minimal diligence, could be demonstrated to be a liar, so that he can fill space with misleading claims. How does that help the debate, or better inform readers? There we have it though. The legacy media, quite clearly, is not in the business of information. At the very best, it is an industry devoted to filling space on various platforms for pecuniary gain. And day-by-day, its credibility drains into the sand as readers appreciate the poor quality of the product they are selling. The only problem is that the media is more than just an industry. Its role in informing and educating the public is vital to the functioning of any democracy and, in pursuit of that aim, journalists and their employers claim special rights and privileges. Sadly, all too often these days, they are working under false pretences. The ill-informed trash they produce is often not worth the time expended in reading it. So unreliable are their claims that one can take nothing on trust, and believe nothing without independent verification. But when newspapers so easily give succour to known and practised liars, making no effort to check the accuracy of content, we are plumbing new depths. Never more was it so necessary, in an increasingly fractious Brexit debate, to have accurate, informed and responsible media. Instead, what we've got is a fill-space mentality where any old garbage will do as long as there's a prestige name to put behind it. This would not be quite so bad if it were not accompanied by an overweening arrogance, where issue-illiterate and largely ignorant hacks feel entitled to regale us with "explainers" and facile, Janet & John tracts which purport to tell us "everything you need to know" about one or other facet of Brexit, but in fact serve to perpetuate error and misunderstandings. When all they are doing is parading their lack of grasp of a complex subject, it is hardly surprising that they are reluctant to bruise their egos by brushing up against people who actually know what they are talking about – which is largely why such people are so rigorously excluded from their closely-guarded domains. Ignorance is only sustainable as long as the "herd" sticks together and presents a common front. And, of course, that is only the half of it. Not only is the media incapable of dealing with the technical detail of Brexit, what little it does produce it drowns in a torrent of trivia and court gossip, so overwhelming in volume that one struggles to filter out the noise in order to get some sense of what is actually going on. But the one thing we have learnt of the media: working for the big names means never having to admit you are wrong on any substantive detail, and never having to say you're sorry. Day after day, the media can churn out its diet of trivia and trash, and there will always be enough "marks" to slurp it up, while the clapping seals will burnish the egos of the hacks who produce it and tell them how wonderful they are. When this is all over – if it ever ends – there should be another Leveson-type inquiry, although a proper one this time, in which the dereliction of the media on Brexit is properly charted. It won't happen of course. There are too many vested interests supporting this garbage industry and – if the truth were told – too little interest in pursuing accuracy or the truth. In that sense, where it is said that we get the government we deserve, by the same token we get the media we deserve. A public content, uncritically, to feed on trash, is going to get fed trash. There may be plenty willing to provide it, but there are plenty willing to accept it.